It is listed as having a softer recoil, and an easier racking mechanism. As an older woman I think both of these features would be helpful, lets hope it lives up to my expectations. 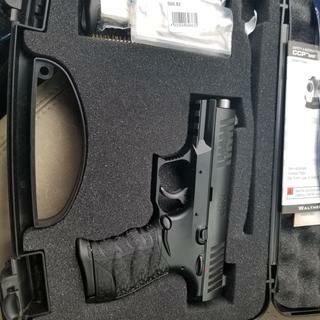 FANTASTIC CARRY GUN , WALTHERS ARE AWESOME ,BEST PRICE ANYWHERE!!! Awesome carry pistol. Not much kick for the small frame. Great grip, easy field strip. My new favorite carry. Love this gun. Being a 5ft. Female it is a great size for me to keep conceled. GREAT GUN . SIGHTS WERE TERRIBLE , I REPLACED THEM WITH TRU GLO 'S. THE TRIGGER IS NO 1911 TRIGGER BUT PLENTY GOOD FOR WHAT IT IS INTENDED FOR. SMALL BREAK IN PERIOD ,SO DONT PANIC IF YOU HAVE A HIC-UP OR TWO. I CAN THROW THIS PISTOL IN MY BACK POCKET AND GO WALK MY DOG . IT IS 100% RELIABLE . JUST LIKE THE PPQ 'S . GREAT GUN , GREAT DEAL , GRAB A GUN GREAT TO WORK WITH AS WELL. The Walther CCP has the reputation as one of the softest-shooting concealed carry pistols on the market thanks for SoftCoil technology. The SoftCoil gas-delayed blowback system uses gas pressure from the ignited cartridge by directing it through a small port in front of the chamber to slow down and delay the rearward motion of the slide. Unlike the gas system in an AR-15—where the gas is channeled BACK towards the action—the SoftCoil system actually channels gas FORWARD, which retards the rearward motion of the slide until gas pressure has decreased. This operating system has a number of benefits. First and foremost, it allows the gun to fire from a fixed barrel, which makes it inherently more accurate. With a carry gun like this, that's critical. Second, it allows the gun to have a lighter slide and lighter recoil spring. Carry pistols are notoriously stiff—but you'll notice that working the slide is nice and easy. There was just one problem: takedown of the original CCP was a chore that required a special tool. Well, the all-new CCP M2 solves that problem with simple tool-less takedown. Field-stripping and cleaning have never been easier. It's still soft-shooting. It's still accurate. It's just a little easier to own. Because the CCP M2 has both a manual safety and a firing pin block safety, the trigger can be nice and light at right around 5.5 pounds—another huge advantage over other carry pistols. The grip is nicely textured for firm grasp, and the highly-undercut trigger guard allows for a high hold and better recoil control.